try something new every saturday! 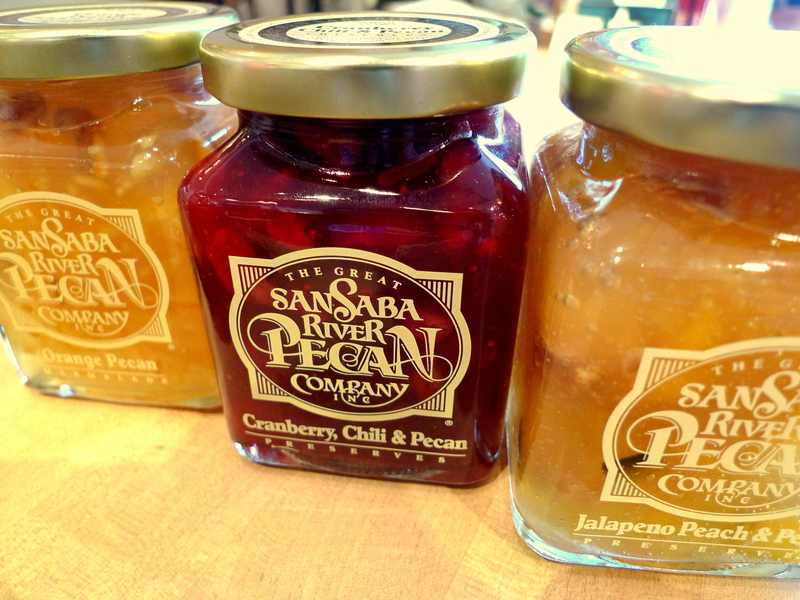 ever wonder why we decided to carry these jams from San Saba River Pecan Company? yes, we realize the company’s name is a mouthful, and their concoctions can be a bit daunting to try. if you are not sure how Cranberry, Chili, and Pecan preserves will taste like, come to our store on Saturdays to find out for yourself what we discovered at the trade show: these award winning preserves are delicious! the pecans come straight from the company’s orchard, which is located right in the heart of Texas’ famed Hill Country; you know you are getting the freshest nuts inside every jars. these flavors are undeniably memorable — a great addition to your party or your morning toasts! You forgot the “… Inc.” in the company! Ha ha ha. These do look like the kind of artisan preserves I love! Look at that gorgeous color! If you ever in that area (Hill Country, Texas) you can go and visit their orchard. with some cold cut meat, crisp white wine, and those jams… yum!